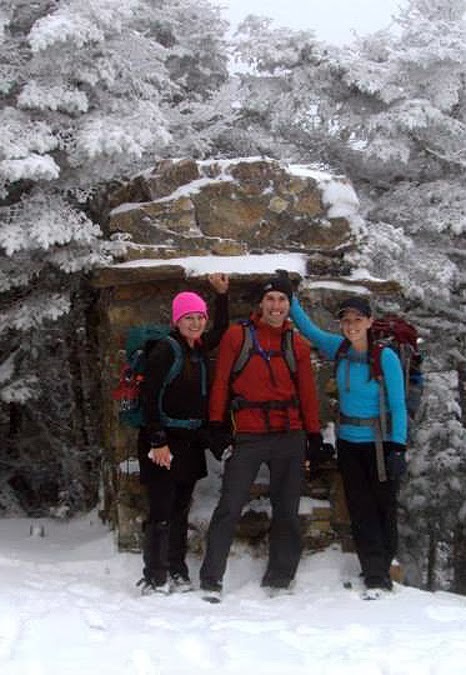 - Whitney, Denise, and Samantha let me tag along for their hike of Mount Waumbek. I was excited because I had not been to Mount Waumbek since August of last year. We all met at the Starr King Trailhead, it was a very chilly start at 9 a.m. but we all warmed up quickly as we hiked up the frozen and lightly dusted snow laden Starr King Trail. - The Starr King Trail has gradual grades and decent footing all the way to Starr King's summit and then over to Waumbek. As we made our way to the summit of Starr King the snow depth increased, never more than a few inches and I was able to make it by with my trail runners. - As winter weather settles over the mountains it's important to pack the necessary gear for those 'just in case' moments. Even on a small hike it's important to be prepared for the worst. Of course, this means heavier packs! Samantha made a comment which I say in my head every year around this time as the pack gets heavier "Time to get in winter hiking shape!" So true! - As we reached Starr King we were greeted with incredible views...of the inside of a cloud! Unfortunately we out hiked the clearing weather, however, the pine trees were all blasted with snow and frozen making for a winter wonderland feel. - We hiked at a good clip down into the col of Starr King and Waumbek and made it to the summit in no time. Along the way we passed a guy and his dog, it was the first dog I ever saw on the trail that was skittish around me, how weird! - We had lunch and enjoyed Whitney's delicious Butterscotch-Heath Bar Brownies on Mount Waumbek. 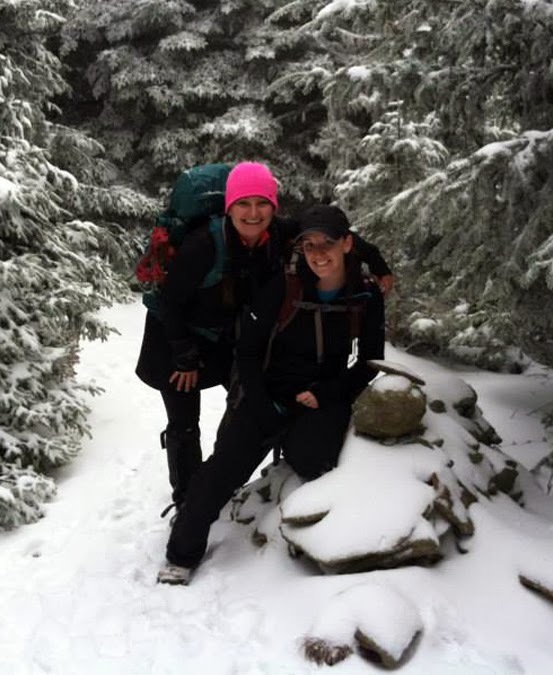 It was also Samantha's 44th peak, only four more to go, congrats Sam! - The hike out was a breeze, we saw a couple other hikers along the way, Waumbek is a popular little mountain and unlike other viewless mountains it has some character! - Back at the trailhead we all got into warm and dry clothes before heading our separate ways. Of course as soon as we headed south and east on our drives the views opened up and the Presidential Range was in full view from Route 2 in Jefferson. Nice way to end a fun morning in the White Mountains! Samantha rock climbing the fireplace! Yellow blaze, will not be visible for too long! Loving the title of the blog post, lol! Chris hiking with the girls! Looks like the four of you had a great hike in the snow. Pretty pictures! Thanks Anonymous! It was a lot of fun to be invited along to hike with the girls. They're a great group, are funny, and strong hikers!